This text was written and read by her son Graham Harding at Jean’s funeral on 16th July 2008. Six years ago I stood here to testify to the life of my father Robert. Now Jean has come – in joy rather than sorrow – to join him in Bromley Churchyard, looking out over the Essex countryside that she came in time to love. For, as many of those here today will well know, she was not a native of these parts. The Tendring Hundred was a later love affair after the mountains that had captivated her heart as a girl. She was born just over 85 years ago in Manchester, the youngest child of Liberal freethinking parents and she retained a lifelong sympathy for the oppressed and exploited. Her father, Duke, was a brilliant chemist and later one of the founders of ICI. Jean was thrilled to discover earlier this year that his ground-breaking and highly successful book on Organic Medicinal Chemicals has just been re-published. Her wise and warm mother, Thea, was the beautiful daughter of Captain Thomas Wood, a South Seas trader captivated by the youngest daughter of a family emigrating to New Zealand. They married in Wellington and sailed back to Scotland , where Jean’s mother was brought up. That combination in her background made her a romantic at heart – as she herself said “I enjoyed and grew up into a mind world of art, poetry, criticism, discussion, literature, joy of nature and the countryside” – but she was a romantic with a sharp and very practical intelligence and a strong infusion of her mother’s thrifty Scottish nature. All toothpaste tubes were squeezed for the very last drop and the paper stock for her printer invariably consisted of the unprinted sides of official letters and documents. She left school at 16 in 1939 and believing that University would be an irrelevance at such a time went instead to a train in domestic science in Manchester. She became one of the Ministry of Food’s demonstrators talking to audiences across the country about healthy eating. First in Manchester and then in Harpenden where her parents had moved to after her father’s first stroke she was celebrated as an amateur actress of great beauty and great potential. She gave up the possibility of a professional career to marry Robert and returned to acting only in recent years when she inspired and organised play readings in Wivenhoe. She had had both passionate relationships and offers of marriage during the war years but in the end it was Robert who swept off her feet after a first meeting at a dance for returning heroes in Harpenden in June 1946. Three months later they were engaged, married three months after that and living in Great Bromley at the Hollies (a name she hated all her life) by the end of the freezing winter of 1947 – the worst of the 20th century. To live in the country was what they both wanted but after the urban comfort of Manchester and Harpenden it was a shock to Jean in particular. There was no hot water and the lavatory was, as a friend eloquently, described it, a ‘short bicycle ride down the garden’. With three children and a driven, workaholic husband, life was hard at times. The household budget for food was 10 shillings a week and when money was short she turned to the wartime staples of nettle soup and herrings in oatmeal. But there was still time for all night dancing and parties and a whole set of memories could be constructed around the food that we were brought up with – the hundredweight and more of marmalade she made every year, the near daily deliveries of bread from the bakery at Ardleigh, the thick cream bought direct from Barbara Earith at Vinces Farm in Ardleigh, the ribs of beef and the hams cooked for the annual Tendring Hundred Show parties. As a mum she was wonderful. We ran wild in the woods around Bromley, we skated on frozen water meadows (with skates bought at auctions by Robert), we sailed at Wrabness, where we once spent a cramped but idyllic summer living in a 9 ft by 5 foot cabin. We feasted off fruit from the garden. We acquired a taste for grown-up parties and the conversation and food and wine that went with them. We went on epic holidays to South of France and Italy that started with all night drives across Europe in a tiny Austin A30 with children sleeping across the back seat and floor. Once a helpful French policeman had to be prevented from getting into the backseat to provide midnight directions out of Lille or Amiens . But a change was coming. As we grew older, so Jean had more time and energy for other interests. She began to find her voice as a woman in her own right – not without some struggles with my devoted but occasionally jealous father. It took some time but in the process she and Robert found a deeper love and deeper partnership – each supporting and challenging the other to the end. In 1971 she started an Open University degree – eventually graduating with a 2:1 in Humanities. She became an entrepreneur in her own right, starting the Wivenhoe Bookshop with Penny Bell. The bookshop still thrives under her successor – indeed it has just been nominated as best independent bookshop in the country. That marked the real start of her long association with Wivenhoe where they moved in 1999 when Robert’s Parkinson’s started to make the Hollies too much of a burden for both of them. 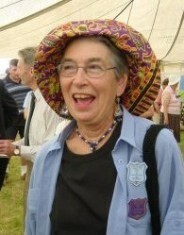 Jean became in this period a campaigner and organiser. She had joined Robert in the 1960s as one of the founders of the Seven Rivers Cheshire Home , the 11th in what is now a worldwide chain of hundreds. In line with the philosophy of the founder, war hero Leonard Cheshire, she scrubbed floors, cared for patients, raised money and fought to establish the home as a going concern. This dedicated service was inspired by the sufferings of a family of close friends – seven of whom eventually died of an incurable hereditary neurological condition. Jean became the inspirational founder of the Essex branch of the Huntington’s Disease Association, with great support from Robert during the early years of his struggle with Parkinson’s. As the Parkinson’s worsened, Jean became his life support system – caring for him devotedly, deciphering his increasingly spiderish writing, helping to bring to life the parties and celebrations that they dreamed up for every occasion. Just a few days ago was the 90th anniversary of Robert’s birth and over the weekend I went to the Tendring Hundred Show, which he and she played such a role in developing. Jean was never part of the formal committees but in the suppers and glasses of whisky after committee meetings at the Hollies her contribution was vital. She started the Art Show and helped start the process which turned the Show from a traditional agricultural show into a county-wide organisation that focused on linking the vibrant local agricultural community to a wider world and in the process made it the best one day agricultural show in the country. Such is a sketch of her life. It omits so much: her travelling (by banana boat, by bucket shop airline, by classic train), her eye for colour and beauty evinced in the dozens of local paintings that fill every serene yet vital room in her house in Wivenhoe, her intuitive skill as a gardener and much more besides. Above all it omits her greatest gift. This was the ability to inspire others to believe that they too could change their lives. A friend of hers and mine said to me at the Tendring Show on Saturday that she had the capacity to throw off sparks of inspiration. That gift crossed the generations. Like her beloved mother Jean had a remarkable ability to form deep and long-lasting relationships with younger people – often those distant from their own parents and families. She loved the diversity of views and experiences they could relate to her and they drew love and strength from her. There are many here today who were changed by knowing Jean. She believed in dreams but knew that making dreams come true demanded effort and commitment. She was a very down to earth visionary. Her unerring ability to cut straight to the heart of every and any issue was both inspirational and terrifying. She had great personal power – though she did not always acknowledge it and always shied away from fully exercising it. Several times in the course of her long life she was picked out from the crowd as someone with the power of healing in her hands or the power of second sight. Less than a year ago she was taken by American friends – part of the Stone Family connection that she initiated and which has done so much for Bromley Church – to a Hopi Indian ceremony in the mountains of New Mexico. She was instantly recognised by the elders of the tribe and inducted into their inner circle. Only Jean! With her energy, her intelligence and her charisma, she could, in other times and other circumstances, have become something very different. Would she have had such a full and satisfying life? I’m not sure. She was never afraid to challenge convention. She never accepted mediocrity for herself and no-one could spend time with her and fail to be infected with that same sense of possibility. To deal with her you needed to find your own sense of conviction and your own sense of self. I found on Saturday a few lines in her handwriting on old age (which she disliked). The last line was this: ‘old age is dying your hair purple’. And that’s what she did. She never gave in to age or conventions.She had beauty, style and attitude – and a wonderful smile – to the very end. This page was added on 12/06/2015.